Juicy, sweet, acidic and full of vitamin C, oranges were once the most cultivated fruit in the world. Even today, the orange tree is highly prized and enjoys great popularity. Although many varieties exist, Citrus sinensis, the sweet orange, is by far the most appreciated and widely cultivated citrus fruit. Oranges are fragrant, acidic, sweet and incredibly juicy fruit, with great health benefits. However, people with sensitive stomachs or digestive problems might find the acidic juice of the fruit may bother them and should go for orange varieties without an acidic juice. Consuming both the fresh fruits and their freshly-squeezed juice can supply the body with a variety of minerals and vitamins, notably vitamin C, as well as potent phytochemicals such as flavanones and anthocyanins, not to mention polyphenols, all of which boast amazing health benefits. However, remember that juicing fruits not only extracts their nutrients, but exposes more sensitive nutrients like vitamin C to air, light and oxidation. In order to minimize the loss of vitamin C, it is best to drink your orange juice as soon as possible after making it. What do oranges look like? Oranges are citrus fruit that grow on the orange tree, an evergreen tree that can reach heights of 10 to 15 meters. The tree produces pleasant-smelling, star-shaped white flowers whose pollen and nectar is the main source of the fragrant orange blossom honey (see benefits of orange blossom honey). Fruits are called oranges and come in a range of varieties, from the common sweet orange to the bitter orange and mandarin orange to the orange with little to no acidity or blood orange. The fruit can be spherical, oval shaped in some varieties or round and flattened at the ends like in mandarin oranges. The rind is usually thick and hard to peel, except for the mandarin orange or varieties grown for this trait especially. Depending on the variety, oranges may be as small as a tomato or as large as a small grapefruit. The unripe fruit is light green in color and matures to become bright orange. Some varieties have a deeper orange-colored rind. The rind is usually bumpy, more so in mandarin oranges. The white, spongy part between the rind and the pulp is edible and is called a pith or an albedo. It is an important source of antioxidants. On the inside, the pulp is grouped in segments and may or may not have seeds. Usually, seeds white and look a lot like apple seeds. Depending on the variety, the pulp may be a deep yellow or light orange, deep orange or deep red. What do oranges taste like? Oranges are citrus fruits and contain citric acid, an acidic compound responsible for their well, acidity. They are also a good source of vitamin C which gives them a sour taste. Overall, they have an invigorating taste and a fresh flavor. Some varieties like the mandarin orange or the tangerine are sweeter and less acidic. Others have very little citric acid and are more suitable for consumption for those with digestive conditions such as gastritis or acid reflux. Fruits may be extremely juicy or yield only small amounts of juice. Fruits may preserve patches of green rind even though ripe, although most producers will treat the rind with ethylene gas to force a uniform orange color. Ethylene gas is used to break down the green pigment, chlorophyll, and thus make oranges look much more appealing. 2) Blood orange, with a darker, red-orange rind and a deep red, juicy flesh. 3) Navel orange, having a second, small, undeveloped orange at the base of the fruit, similar to a navel. 4) Acidless orange, which lack the distinct acidic flavor of regular oranges, are low in citric acid. The rich, dark-red color of blood oranges and pink-fleshed navel oranges are caused by a significantly high anthocyanin content. Anthocyanins are flavonoid pigments which have demonstrated potent antioxidant properties and are believed to protect against free radical damage and prevent diseases such as Alzheimer’s, cardiovascular disease, atherosclerosis, chronic fatigue and cancer. Oranges with very little citric acid, sometimes called acidless oranges, are great for people dealing with heartburn or gastritis or just have a more sensitive stomach and thus need to keep away from acidic foods (see what foods to eat and to avoid for gastritis). However, these varieties tend to spoil faster than all the other orange varieties because they simply lack the citric acid to keep them fresh for longer periods of time. The common sweet orange is, nevertheless, the preferred variety, hence its great availability throughout the world. Even more, it is full of potent phytochemicals and regular consumption can have great benefits for our health. For instance, oranges are a rich source of hesperidin, a flavonone found in citrus fruit. Animal studies have shown that hesperidin can reduce high blood pressure and cholesterol levels. Moreover, it has a strong anti-inflammatory and antioxidant effect. Regular consumption of fresh oranges can thus help keep blood pressure and cholesterol levels within normal limits and reduce inflammation. But remember: hesperidin is found in the thin and slightly bitter white layer on the interior of the rind called pith. Interesting enough, the pith is often removed when making orange juice and other orange-based products on an industrial scale which means important nutrients are lost. Consuming fresh oranges (pith included) may be the best way to ensure you get the proper intake of nutrients and after a short while you will come to appreciate orange pith as well. Oranges are best known for their vitamin C content. A little over 100 g of fresh orange can supply our body with 100% of the RDI (recommended daily intake) of vitamin C. As you may already know, vitamin C is great for immunity, reduces inflammation and has antioxidant properties. Regular consumption of oranges can thus reduce the severity and frequency of bacterial infections, colds and keeps us looking young and fresh due to vitamin C stimulating collagen production. In addition to this, vitamin C interacts with other phytochemicals found in oranges, cyanidin-3-glucoside, flavanones and carotenoids, which significantly increases their radical-scavenging properties. Although the mechanisms are not yet fully understood, it appears that the phytochemicals found in oranges boast a trully uncanny antioxidant activity, protecting the cells from free-radical damage and oxidation related diseases. Moreover, oranges are a great source of dietary fiber, indigestible plant material which reduces cholesterol levels by preventing the intestinal absorption of fat. 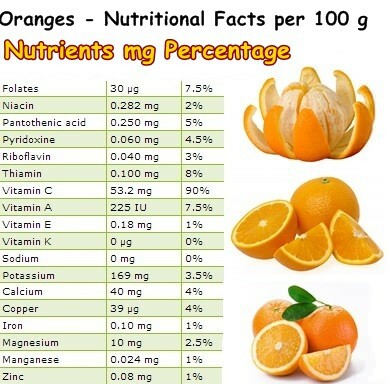 Eating oranges whole (pulp, pith, preferably not the pips) can supply the body with significant amounts of fiber and thus contribute to a healthy diet. Last but not least, oranges provide us with small, yet important quantities of other vitamins and minerals such as copper, calcium, potassium, vitamin B1 (or thiamine), vitamin B5 (or pantothenic acid) and vitamin A. Overall, oranges make a wonderful addition to any diet and their high phytochemical content can significantly improve health in general. Fresh oranges or home-made orange juice can be a treat on their own. But if you want to spice things up, you can always go for bolder recipes such as diced chicken breast, walnuts, sunflower seeds and orange slices with a salad dressing of your choice. Just remember that cooking the fruit causes it to lose most, if not all of its vitamin C content. Similarly, if you make orange juice, it’s best to drink it fresh or else it will slowly lose most of its vitamin C.
Orange marmalade and orange blossom honey are other famous orange-based products. When it comes to orange juice, it would be best to make you own. Commercially available orange juices often contain additives or preservatives and may lack certain nutrients due to pasteurization. And you needn’t worry: home-made orange juice can last for about 10-12 days in the fridge due to the acidity of the fruit.